Amp now bought, asking for suggestions re: NOW what????? OK, guys 'n' gals, I have decided that I have enough juiced acoustic guitars that I really do need to get an amp. I would like a single small amp so that I won't need a trailer to do solo gigs. I really prefer the sound of Class A (Tube amps) over Solid State, so I'd like for the amp to be a tube type. I don't need a large speaker, so a small speaker (6.5"-8" would be fine, I think) seems advisable. I am not going to be playing large venues, just small bars, that sort of thing. The larger bars have a PA system into which I can and do already plug in. You'd think I had asked for the moon and the stars to hear the advice I got from online retailers. What do you all use? I can't imagine I'd ever want to use distortion or pedals or any of that stuff...just make my guitar and my voice loud enough to be heard over the din. So...what are you using, folks? Thanks in advance for whatever advice you can offer! For most acoustic players a tube amp is a non starter. The tubes will colour the sound. You can't get around that. Most acoustic players want the amp to do nothing, just make the natural sound of the guitar louder. A tube amp just will not do that. They are just not designed for amplifying acoustic guitars. So having said that, I can't suggest any tube amp. If you can get beyond the tube amp requirement a simple, very natural sounding amp with a 1/4" and XLR input, a few nice effects is the Fishman Loudbox series. I use the Fishman solo amp 220. It's sort of a poor mans Bose. Stick array, easy to set up, great sound. And a bonus, Fishman has great customer service. But it's overkill for what you want. The smaller loudbox series will do the job very well, but it will not be a tube amp. Thanks, Keel! The reps online never explained it that well. You are right, I'm only interested in more volume and the solid-state combo amps all have multiple special effects features, which did not interest me. Having been an audiophile most of my adult life, where Class A equipment is the "holy grail", I assumed it would produce better results than solid-state gear. I will check out your suggested gear...thanks for a great explanation! Many moons ago (early 80s) I used to use a Roland JC60 with both my EA44 Monterey and for electric guitar. Great amps, and worked really well with elect/acoustic . Really clean tone, and a hint of the built in chorus was really nice too. I note that Roland now make an "AC" series specifically for acoustic guitars as well. I haven't used one, but if they are anything like the quality & tone of the JC series they would be worth checking out. I'll also add a thumbs up for Roland equipment. I have a small Roland Street Cube I use for farmers market gigs where electricity is not available. It uses 6 AA Batteries and will last 6-7 hours at modest volume levels. You can also operate off standard 110 power. It has a 1/4" and a XLR input. Some surprisingly good effects, reverb, chorus, etc. Simple EQ controls. Very nice piece of equipment. FWIW Dugly a few simple effects are a good thing. Just a three EQ controls; low end, mid and treble, plus a bit of reverb go a very long way. I have one, ten feet away. I bought it for the reasons you list. Also works great for blasting tunes. I have been looking at Behringer electronic crossovers...want to tri-amp a set of large, high quality loudspeakers, so I know already that I like the Behringer products. Thanks, Tony, I will check it out! 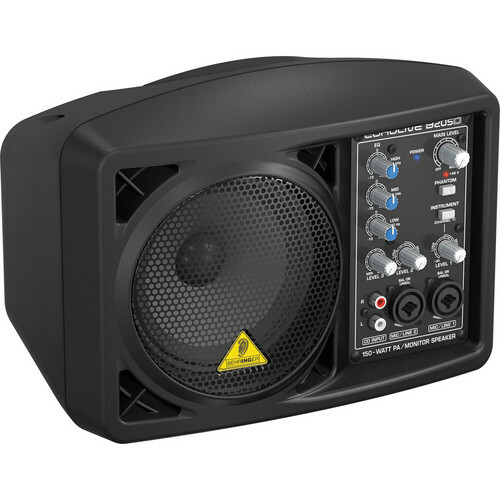 The Behringer Tony suggests looks like a nice, small PA/monitor. One small caveat, you will not be able to adjust the EQ for guitar/voice independently. For example, if you want a mid range scoop for the guitar and a bass boost for vocals you're out of luck. May or may not be an issue for you. Just something to consider. I've had a lot of trouble with Behringer mixers - 1202FX. To my mind, the quality just isn't there. i tend to side with the Roland Street Cube recommendation. Good quality gear. DAMN!!! I had typed a lengthy update and all of a sudden the computer blanked out for a second and it was all lost...let's try again! Well, it's all over with (for now), guys 'n' gals. I made a trip to the closest music store (which is 90 miles away in this sparsely populated area of the mid-west), just to get a $10 harmonica for one of my students here at school, and when I asked about amps the owner of the store showed me a whole stack of stuff. I looked it all over and pulled out a Fender Stage 112SE (it says PR203 on the back of the cabinet) Obviously the 112 means one 12" speaker (it has a HUGE magnet, and is heavy but not so heavy that I cannot carry it for short distances). The front panel contains 1/4" inputs for two channels (one is called "Normal" and the other is called "Drive"), a foot switch, as well as 1/4" inputs/outputs labeled "pre-amp out", "power amp in", and "line out". The "Normal Channel" has a volume control, a treble control, a mid control and a bass control as well as a push switch between the mid control and the bass control labeled "Mid Shift". The "Drive Channel" has a gain control, a contour control, a treble control, a bass control and a volume control, as well as a push switch between the bass control and volume control labeled "Drive Select". There is also a "Reverb" control. It also has the foot switch in the cabinet. OK, so my first thought is that I got in WAAAAY over my head, considering what I had hoped to get, but for $250 how could I go wrong? In the end, I took the advice of every one of you who said not to try to use tube gear, and that was the main reason I went solid state. I also bought a mic, so weâ€™ll see if one of the two inputs will tolerate a mic. The owner of the store said the amp was the property of an old lady whose husband had died. He had used the amp for stage work. With the exception of a slight bit of rust on one of the chrome corner protectors, it looks like it just came out of the box this morning. It was obviously well cared for! When I asked if the lady whose husband had died had any other items she might want to sell the owner of the store said there were hundreds of items at the house, so I left a business card and asked the owner to contact the lady and see if she would consider letting me come look at the items to see if I had any interest in any of them. 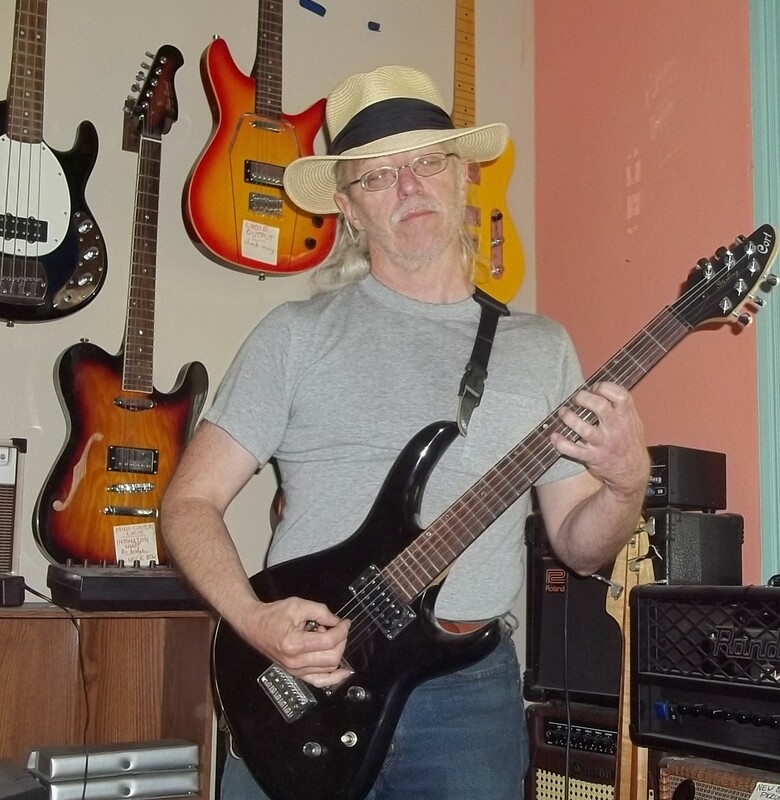 I am thinking about starting to offer beginner/intermediate guitar lessons and who knows what I might find there? Re: Amp now bought, asking for suggestions re: NOW what????? Is there a model of Cube that's able to meet the specification separate inputs for a microphone and for a single instrument? Though I'm a Roland fan, I've lost track of their amp models. Is the Fender combo going to work with a microphone AND a guitar? I had an old guitar amp that'd do that, but then again it was MADE with the intent of running two inputs; most "two input" amps are A-or-B, period, no AND. Besides, the setup was always at the ragged edge of squeal; guitar amps aren't optimized for microphone input, & a lo-Z (low impedange) mic would need an inline transformer. I haven't really tried to find the limits of the amp, Tony...but I did plug the mic into the "clean" input (not the one with both "Gain" as well as "Volume", which I expect will be the one to use for effects..but, again, what do I know. I did manage to download and print a manual for that model, but it isn't much help. I do believe that both the guitar and the mic will function together. The mic did work well, but IIRC I use the input with the greater impedance...but, again, I'll have to check that out and come back to this thread once I know for sure....I'm posting from work right now. I'll also get the info on the mic....what the impedance is, that sort of thing. Cheers...I'll be posting again once I get home from work and try the amp and mic together. Yes, the mic and the guitar both work simultaneously. I even reversed the inputs to see if that made any difference and it doesn't, so the mic will work with either "channel" and the guitar will work with either "channel". I was a bit surprised because the impedance of the two channels seems to be so different...and I have not tried either of my "electric" guitars, yet, just my Takamine and my Washburn A/E's. I did try out some of the tone controls and they do seem to make a difference in the "quality" (perhaps that should be "accuracy"??) of the guitar's sound...there is nothing that can improve my voice, though, so that's about all I can say about that! The fender amp you bought will work, but with some limitations. Couple of observations. Both inputs are 1/4". The preferred option is a XLR input for the mic and a 1/4" for the guitar. Some PA's and amps now use a combo jack that can accept a 1/4" or a XLR. With only 1/4" jacks as an option you will have a tough time finding good quality mics. Another limitation is the reverb control. It controls whatever is coming out of the amp. You cannot adjust for each channel. The amp you purchased is really for use as a combo guitar amp, not a small PA. It's not really set up to handle vocal and guitar. It will work, but with pretty severe limitations. I hate to further rain on your parade but you also overpaid. That amp can be bought for something in the $125-$150 range. Here is a local Cl ad for one. Sorry Dugly.